What is a crucial conversation and why do we care about it? A casual conversation turns into a crucial conversation when opinions vary, stakes are high, and emotions start to get into play and run strong. Crucial conversations are day-to-day conversations that affect our lives. They are not only conversations that happen around a conference table amongst the high ranks of presidents, emperors, and prime ministers. Interestingly, for us, as conversations get more and more crucial, our ability to handle and manage them well lessens. It is an irony that when something matters most, we do our worst. 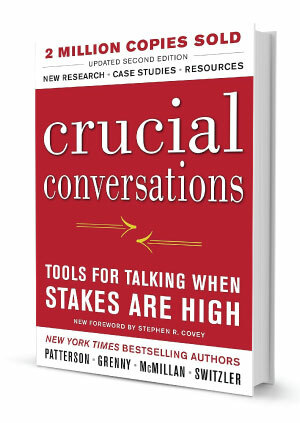 Crucial conversations are usually spontaneous and we end up feeling pressured, stumped and act in self-defeating ways. The impact of not being able to handle a crucial conversation well is high and it can affect every aspect of our lives – our careers, communities, relationships and even our personal health. It can impact the overall quality of our lives. Generally, we can do one of these three things when we come face-to-face with a crucial conversation – 1) we can avoid it; 2) we can face it and handle it poorly, or 3) we can face it and handle it well. Patterson, Grenny, McMillan and Switzler, authors of Crucial Conversations, believe that if given the three choices, we would all want to be able to handle them well. Hence, the writing of this book – to give us a handle and some tools for talking when the stakes and emotions run high. So, let’s explore how we can step up to crucial conversations and handle them well. Martin Luther King Jr says, “Our lives begin to end the day we become silent about things that matter”. The authors of this book studied Kevin, one of eight vice-presidents in a particular company who had been identified as exceedingly influential. What was his secret? After trailing Kevin for almost a week, they began to realise that what set him apart was his ability to avoid what we commonly call the “fool’s choice”. Most of us make the mistake of believing that we have to choose between telling the truth and keeping a friend. What is this skill that Kevin and many others like him possess? Is it a skill that can be acquired? What was Kevin able to achieve? At the heart of every successful conversation is the free flow of relevant information. During risky, controversial and emotional conversations, people who are skilled are able to find a way to get all the relevant information, both from themselves and others, out into the open. This type of people have the ability to get people to willingly share openly and honestly. This amazing talent and skill is called dialogue. Dialogue happens when there is a “free flow of information between two or more people”. So, how exactly does a free flow of information lead to success in handling crucial conversations? And what does one do to encourage the free flow of information? There is this concept of the Pool of Shared Meaning. Typically, people who are skilled at dialogue do their best to make it safe for everyone to add their meaning to the shared pool. They encourage everyone to fill up the pool of shared meaning, whether wrong, different, controversial and at odds with their own beliefs. As the pool fills up, people are able to make better choices. Conversely, when people intentionally withhold meaning from each other, it is not surprising that individually smart people can make collectively stupid decisions. The whole idea is to encourage people to contribute all their ideas, opinions and thoughts into the pool of shared meaning. When this happens, it increases a group’s ability to make better decisions tremendously. On top of that, since the pool is shared, people willingly embrace and act on the decisions they make in unity and conviction of heart. In other words, the authors put it well when they say, “The Pool of Shared Meaning is the birthplace of synergy”. The reverse is sadly true. When people are not involved and are sitting back quietly during crucial and touchy conversations, they are rarely committed to the final decision. Sometimes, people retreat into silence. They play Salute and Stay Mute. They rather not confront those in authority. Information and meaning is withheld from the pool. We adopt the silent treatment. The good news is that dialogue skills are learnable. We will now explore various tools that we can use to help create the right conditions for dialogue to take place. The focus is on how we think about problem situations and what we do to prepare for them. “Speak when you are angry and you will make the best speech you will ever regret” – Ambrose Bierce. The first principle of dialogue is to start with the heart – your own heart. You will have a tough time getting the dialogue right if you cannot get your own heart right. In short, work on “me” first; “us” comes second. That’s the best way to start work on “us” – start with “me”. We must realise that as much as others may need to change, or we may want them to change, the only person we can continually change and inspire is undoubtedly the person we see every day in the mirror. – They focus on what they want. – They refuse the “fool’s choice”. While others would opt for justifying their unhealthy behaviour, claiming that they had no choice except to either fight or take flight, the dialogue-smart group of people always believes that dialogue is still the best option. Constantly asking this question is important because it helps you focus on what is your real motivation and what you want to see achieved through this crucial conversation. Ask yourself this powerful question when you feel the stakes running high – it helps to redirect our hearts and refocus our brains. When you need to refocus and move back to your original motives and intentions, you often need to intentionally take a step back and look at yourself. – What do I really want for myself? – What do I really want for others? – What do I really want for the relationship? When you have established those answers, then ask yourself the final question: How would I behave if I really wanted these results? Another thing you need to do is remember to find your bearings – when you ask these questions and take a conscious step back, you relocate your North Star. Asking these questions achieves two important purposes. It reminds us of our goal, and it helps us refocus our brain. The second tool for one who wants to be in a dialogue is this – Refuse the “fool’s choice”. Be conscious of the moment when you start telling yourself that you must choose between peace and honesty, between winning and losing. Set yourself free from making the fool’s choice by asking yourself new choices. How? Firstly, clarify what you really want. Second, clarify what you really don’t want. Thirdly, present your brain with a more complex problem and combine the two into an “and” question that forces you to search for more creative options rather than silence or aggression. 1. Clarify what you really want – What I want is for my husband to be more reliable. 2. Clarify what you really don’t want – What I don’t want is to have a useless and heated conversation that creates bad feelings and doesn’t bring change. 3. Combine the two into an “and” question – How can I have a candid conversation with my husband about being more reliable and avoid creating bad feelings? Intentionally doing this helps to lead and bring people into a dialogue. Koh Earn Soo and his team take the best books and summarise them into shorter, readable content in the hope of inspiring people to read more and learn more. To read the rest of this summary and summaries of other bestsellers, subscribe to www.thebestbooksummary.com. Click here for more articles about books!